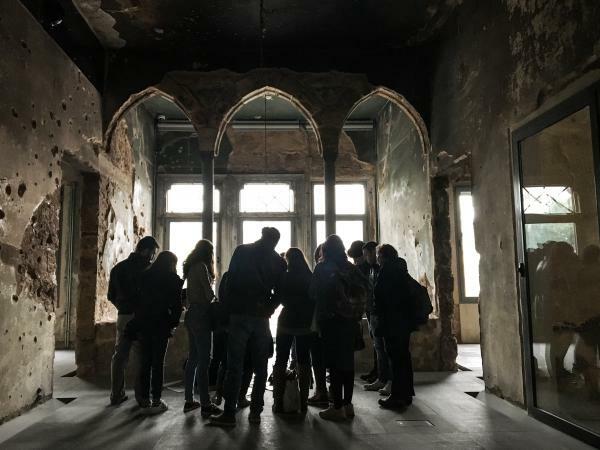 A group of students visits the Beirut mansion that architect Mona El Hallak is working to transform into a museum making sense of Lebanon's civil war. Architect Mona El Hallak says the building was "demolished." But, she adds, "I looked, and I saw suddenly the sky, the blue sky, through this building. There was this amazing hope in this building." Once upon a time, nearly a century ago, this spot lay not at the center of today's energetic if dysfunctional city, but on the breezy outskirts of a much smaller Beirut — just the place where a wealthy family with exquisite taste might commission a fabulous home. So a building that would eventually become symbolic of all Beirut's elegance, wealth and violence was begun in 1924, says Hallak as she points to a chipped inscription over the door. "You can still see the etching in the stone." The sandstone building's architect was the famed Youssef Aftimos, born in the Chouf Mountains in the 19th century, when Lebanon was still part of the Ottoman Empire. Aftimos worked in Lebanon — and elsewhere — through the dawn of the 20th century as it morphed from Ottoman province to French colony and finally, an independent state in 1943. Many of the mansions built during the period he worked still lend central Beirut much of its charm, their shapes reimagining Ottoman and European styles: groups of three arches topping slender pillars and tall windows, red roofs, balconies overlooking the Mediterranean and airy salons where richly colored tiles glowed beneath crystal chandeliers. For a wealthy family named Barakat, Aftimos dreamed up a mansion of ochre sandstone decorated with carvings made from another harder local stone known in Arabic as furne. It is really two houses, each with several apartments, joined together by an unusual central hall, straddling a corner that allowed light to pour into almost every room. The Barakats lived on the second floor, on the side with the best view down the hill to the Mediterranean, and rented out the other apartments. "And they lived happily ever after," Hallak says. "Until 1975." That was the year when simmering tensions in Lebanon bubbled up into a civil war that would seethe — multifactional and fueled by regional powers — for 15 years. The death toll is still highly contested, but tens or even hundreds of thousands are believed to have died. When it was over, Beirut was a shattered city, in some areas every building was damaged or destroyed. Many families left, although some of the Barakats stayed and still live in Lebanon. Paul Barakat runs a carpet business next to a Beirut museum. He welcomed this visitor, although he politely declined an interview. There was no clear winner or loser. Trials for crimes committed during the war have been few: Senior commanders of some of the factions are politically influential today, including President Michel Aoun and Speaker of the Parliament Nabih Berri. Hallak and many other Lebanese people say there is a pervasive fear that public discussion of the war could rekindle tensions — so much is contentious that trying to tell the story could result in contradictions, denials, even violence. The country has no war memorial, and the details of the war are not taught in schools. But with great, great care, Hallak is trying to start the conversation. For two decades, she has headed a campaign to conserve the Barakats' old house and make it into a museum. To raise awareness of her campaign and of the building, she has guided hundreds of groups around it. The students she is addressing are mainly Lebanese, who learn about the war through the lens of their parents' own experiences. "As we all know, Damascus Road became a demarcation line which divided the city in two," she says. The building struck her because it was divided in two by its central hall, and was located on the Green Line, which divided the city during the war. The Green Line, so called for the plants that sprang up during the war in the untended strip of city, split the factions of West Beirut from the east. The Barakat family fled to a safer area of Lebanon north of Beirut as soon as the war began. Militias moved into their house: A building designed so that sunshine could stream into thés dansants, tea dances, also offered ideal sight lines for snipers. The building was notorious during Hallak's frightening childhood, when she and her family lived nearby. After the war sputtered out in 1990, she came across it again as a young architect — a destroyed building among many others. "This building was equally demolished, equally war-torn, there was a bullet in every square centimeter," she says. "But to me, I looked, and I saw suddenly the sky, the blue sky, through this building. There was this amazing hope in this building." As she walked through the house, memories of hiding in her own home under a table with her mother, as fighting raged outside, came flooding back. "If I have all these memories," she realized, "then somebody else will have all these memories — so this is a place of memory." In 2003, Hallak persuaded the Beirut authorities to confiscate the house from its owners the Barakats, who planned to demolish it, and compensate them. 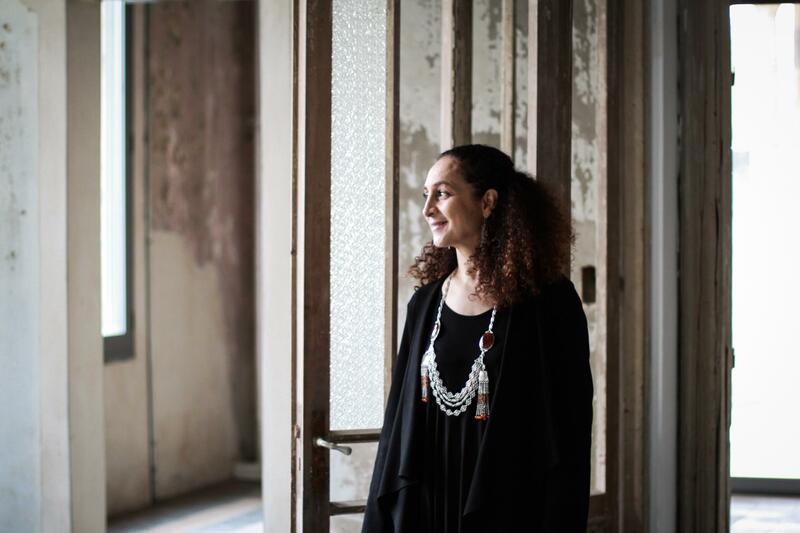 She wanted to turn it into a museum of memory — including of the civil war — called the House of Beirut. For the parts of the museum that do touch on the war, she plans not to include facts, timelines, dates — but rather, she says, "the human experience of war — what happens to you and to your city during war?" She hopes personal stories will play a role in the exhibits. Gradually, the Beirut municipality allocated $19.8 million to renovate the building, preserving some of the old features and traces of the fighting. It now stands ready for exhibits and visitors to arrive. But final paperwork from Beirut authorities that would enable it to open has not materialized. Hallak thinks the delay stems from the fear of touching on sensitive issues. "I think that there will always be fear within the government, within the municipality, that: What have we done?" she says. "We really started talking about the war in an officially owned building." Beirut's governor, Ziad Chebib, said there are no such sensitivities, just bureaucratic hurdles. He thinks a museum covering the civil war now is a good idea, especially as a cautionary tale as the Middle East is consumed by conflict. "I cannot give you an exact date for it," he said. "But I can promise, I can promise you that it will be very, very, very soon." Hallak finishes her tour in the charred remains of what was once a vaulted hall. She tells the students to fight for what they believe in, and they applaud and thank her. Afterward, one of them, Nancy Hawat, says she was inspired by Hallak and fascinated by the house. She is too young to remember the war. But she isn't sure her parents, who lived through the war, would visit the museum. "I felt so weird, actually. I am young and it felt so weird for me, so for my parents and their generation, they will remember the war," she says. "And I don't think they will be happy to remember." Today the Middle Eastern country of Lebanon is relatively peaceful, though a civil war raged there in the '70s and '80s. Often Lebanese people don't like to talk about what happened. NPR's Alice Fordham meets a woman trying to start that conversation with the story of a single building. ALICE FORDHAM, BYLINE: Lebanon isn't big on memory, especially not of its 15-year civil war which ended with a fractious truce rather than clear winners and losers. Lots of people fear that if the war is discussed it will stir up the tensions again. So it isn't taught in schools. There's no war memorial and no museum. But one woman, architecture professor Mona Hallak, is trying to change that via a 25-year obsession with a house that's an emblem of the capital Beirut's elegant distant past and its violent recent history. I meet her taking a group of students around the extraordinary mansion, a vast elegant edifice four stories tall, whose yellow walls and fluted pillars are ravaged by thousands of bullet holes. It's nearly a century old. MONA HALLAK: This building, it's 1924. You can still see the etching in the stone. FORDHAM: It belonged to a rich Lebanese family. HALLAK: Now in 1932, the building was finished. And they lived happily ever after until 1975. FORDHAM: In '75, tensions in Lebanon boiled over into civil war. And the house was right on what became known as the Green Line, dividing East Beirut from the West. HALLAK: The minute the war started, this became a real difficult spot. And everybody left the building. And militias went in. FORDHAM: Hallak shows us how balconies became hideouts for gunmen. The building was notorious during her frightening childhood when militias dominated the city. After the war sputtered out in 1990, she came across the house again as a young architect, a destroyed building among many others. HALLAK: There was a bullet in every square centimeter. But to me, I looked and I saw suddenly the sky, the blue sky through the building. There was this amazing hope in this building. There was - it was destroyed but beautiful. It was destroyed but peaceful. FORDHAM: She takes us through the abandoned hallways, showing snipers' nests built into what were once airy salons. The first time she came, child memories of wartime flooded back. HALLAK: So suddenly I, who lived the war, who hid under tables because I was - the thought that they would protect me from something, I really looked at my mother's face many times under the table because she would crawl with me. And I'm like, is it the last time I see you? And when I stood here, I had all these memories come back to me in this second. And I'm like, if I have all these memories, then somebody else will have these memories. So this is a place of memory. FORDHAM: Since then, Hallak has been fighting to convert this into a House of Beirut, a museum of the history of the city, including the civil war - albeit told very, very carefully. HALLAK: But we're talking about no timelines, no facts, no names, no dates. We're talking about the human experience of war, what happens to you and to your city during war. FORDHAM: After years of campaigning, she persuaded the Beirut authorities to confiscate the house from its owners, who planned to demolish it, and compensate them. Gradually, funds were found to renovate the building. And it now stands ready for exhibits and visitors to arrive. But the final paperwork to open it to the public from the Beirut governorate still isn't finished. It's been years. HALLAK: I think that there will always be fear within the government, within the municipality that, what have we done? We really started talking about the war in an officially - building officially owned by the government. And they want to control what's going to be said. FORDHAM: I put this to the governor of Beirut, Ziad Chebib. And he staunchly denied any political problems and said there were merely bureaucratic hurdles. ZIAD CHEBIB: Unfortunately, I cannot give you an exact date for it. But I can promise you that it will be very, very, very soon. FORDHAM: And then even if the House of Beirut does open one day, will people visit? I speak with one of the students touring the building, Nancy Hawat. NANCY HAWAT: I am young. And it felt so weird for me. So for my parents and their generation, I don't think they will be happy to remember the war because it brings them back bad memories. FORDHAM: She says though even if it's too painful for those who lived the war to visit, her generation will go. It's good to remember the war, she says, because we hope it will not come back. Alice Fordham, NPR News, Beirut. Transcript provided by NPR, Copyright NPR.